Wondering how to get kids hiking in Northern Michigan? One simple idea: bait them with wild berries! Summer finds wild raspberries, black raspberries and even blackberries on the forest fringes. 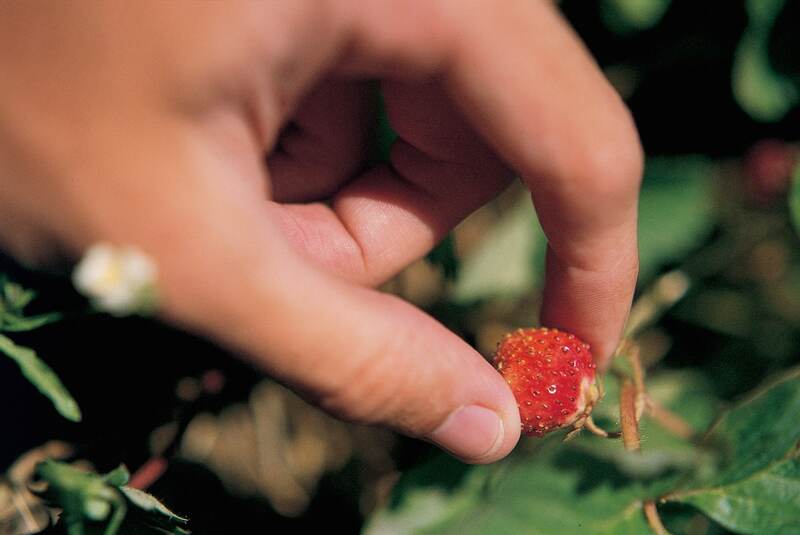 Here are four trails where you are very likely to find handfuls of wild, ripe (and organic!) berries. Leave the cumbersome bucket at home—just let your cubs graze onsite. Before you go, make sure kids know this isn’t a shopping trip or even a U-Pick. They are going to have to work for their treats! Think of it as a scavenger hunt for edibles. That said, make sure your children know not to eat anything you haven’t checked out as an edible berry, and tailor the length of your hike to the age, physical fitness and attention span of your child. Pants and long-sleeved shirts make burrowing into the mass of thorny canes easier. And don’t forget the insect repellent and drinking water. Beware of poison ivy: Leaflets three, let it be! Note: While picking is allowed for immediate personal consumption on the following trails, regulations prohibit picking for commercial sale. This 1.5-mile looped trail is just down the road from the Sleeping Bear Dune Climb and the Pierce Stocking Scenic Drive so it’s fun to make a day of it. The trailhead is at Welch Road and M109. The trail leads up a forested bluff (really a moraine left by glaciers 10,000 years ago!) and past a giant ancient maple with a bench next to it. The top of the bluff opens to a view of Glen Lake—and sunny fields of raspberries and blackberries. From there, the trail winds back into the forest, undulating up and down for a bit. Before you know it, you’re back at the trailhead again! Directions: From Empire, M22 north, bearing left on M109, for 5 miles. Welch Road and the trailhead will be on your right, just past the entrance to Pierce Stocking Scenic Drive. You’ll need a Sleeping Bear Dunes National Lakeshore visitors pass to park at the trailhead. For information: nps.gov/slbe. Forage blackberry bushes gone wild at this 42-acre preserve at the tip of Leelanau County. With 640 feet of Lake Michigan frontage and terrain that moves from old farmland to a dramatic view of the lake and down to a rocky beach, an outing here means berry picking and then some. The trail is a little over a mile long. The best berry picking is on the Birding Loop which is under a mile long. Make sure to keep an eye out for the migratory birds that stop to feed and rest here before and after their flights across Lake Michigan. While you’re out there, stop at the historic Grand Traverse Lighthouse where kids can get more exercise climbing the steps to the lighthouse tower! Directions: From Northport, head north on M-201 through the Village, taking M-201/Mill Street north out of town. M-201 becomes County Road 640/Woolsey Lake Road. Stay straight as County road 640/Woolsey Lake Road becomes County Road 629/Woolsey Lake Road (Co. Rd 640 splits off to the right). Continue for approximately 3 miles until it becomes County Road 629/Lighthouse Point Road and then go approximately 2 more miles. Turn left on Cathead Bay Drive. Parking is approximately 0.1 mile on the right-hand side. Kids will feel like they are walking through a storybook at the Goodhart Farms preserve north of Harbor Springs where working hayfields and old orchards surround the 7.5 miles of trails. Pick wild raspberries along the trail off the Church Road, parking area, then hike on for a bluff-top view of Lake Michigan. Please stay on the trails, and don’t wander through the hay fields. Directions: From Harbor Springs, take State Road north 9 miles to Robinson Road. Turn left on Robinson and travel 3½ miles to the beginning of the preserve at the Hannah Road intersection. Summer parking is off of Hannah, Lone Rock, and Church Roads. This 2-mile trail charts the eastern shore of Boardman Lake in Traverse City. Keep your eyes peeled for raspberry thorns growing in the shaded undergrowth on the gentle slopes along the trail—many can be found just south of the Traverse Area District Library. About two-thirds of the Boardman Lake Trail is paved, while the most southern portion is covered in crushed limestone. The trail is both hiker- and biker-friendly, although the trail is not a loop, meaning you’ll have to be prepared to turn around on the trail (which is recommended) or navigate some of the busier roads south of Traverse City to double back. Directions: Access the Boardman Lake Trail at the Traverse Area District Library at 610 Woodmere Avenue, or by parking near Oryana Natural Foods Market at 260 E. Tenth Street.